A good way to start your Singapore visit is the Singapore Flyer, so you get to see the city from a height. At 165m, the flyer is the world’s largest observation wheel outside of the United States. You will definitely enjoy the panoramic view of Singapore including the iconic sights of the Merlion, Gardens by the Bay, Marina Sands etc. from your safe glass capsule, for about 30 minutes. 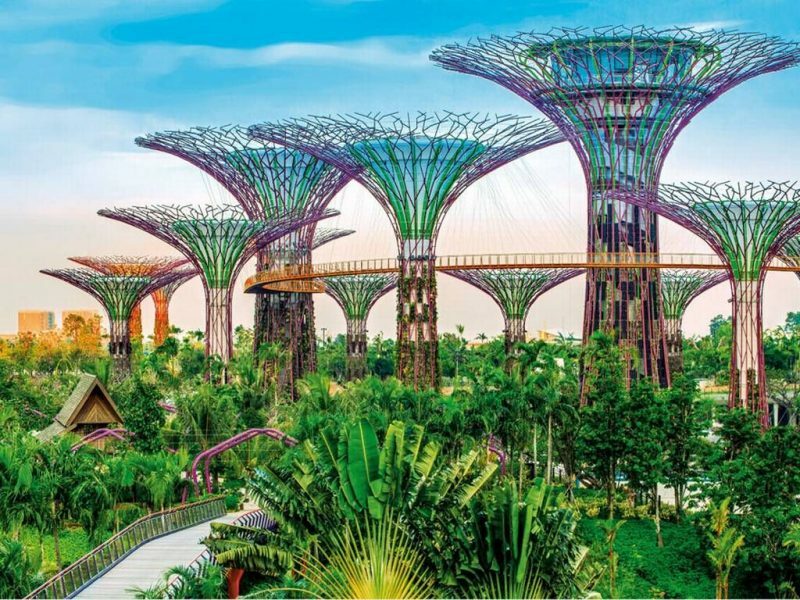 Afterwards, we recommend to take your time and visit Singapore’s most recognisable garden:Gardens by the Bay.Its extraordinary landscape, namely the SuperTrees (18 vertical gardens that reach a height of 16 stories! ), will leave you speechless. Situated near the Marina Reservoir, the park has an area of about 250 acres, near the waterfront of Singapore. The gardens seem to transform Singapore‘from a Garden City to a City in a Garden’. As night descends, the Supertrees are illuminated and acquire a radiant beauty that has now become iconic with this city. Then, for a bit of a splurge, head to 1-Altitude to experience the highest al fresco bar in the world. 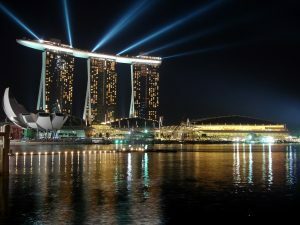 And while there, visit also the Marina Bay Sands complex. It is a complex resort, full offancy restaurants, tones of shops, a theatre a luxurious hotel,an Art Science Museum and other entertainment centres. It also has an indoor skating rink made with synthetic ice. When it opened in 2010, it was the world’s most expensive building ($5.7 billion). And if you want to take a break from the cramped city, the Sentosa island is the place where you can relax without seeing skyscrapers everywhere. Here are the only beaches in town, amusement parks of all kinds (including Universal Studios), shops, restaurants, bars and concerts. You can get on a road or a cable car. Get the cable car, the panoramas are spectacular! You should also take a day to go to the place that brings to life all your Silver Screen fantasies as you ride a roller coaster of immersive and larger than life experiences: Universal Studio. A day spent at the Universal Studios guarantees that there is not going to be even a single dull moment as you zoom through the seven: Hollywood, New York, Ancient Egypt, Sci-Fi City, Lost World, Far Far Away and Madagascar. Nevertheless, any Singapore sightseeing trip would be incomplete without a glimpse of the intriguing Merlion – theiconic landmark of Singapore. The Merlion is a mythical creature with the head of a lion and the body of a fish, the personification of the spirit of Singapore and its history. From the great outdoors to island life, there are so many things to see and do in Singapore! Enjoy the trip and don’t miss all the great landmarks!